Cognizant Recruitment 2018: Cognizant officials have come out with the latest employment notification. Cognizant Careers 2018 job openings will be more helpful for the aspirants who had completed their education and exploring for the job in the IT Sector. 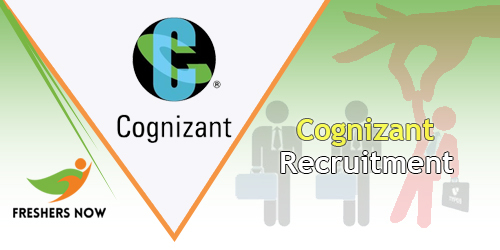 Frequently the officials of the Cognizant will conduct the recruitment drive in a year. This time the officials are planning to recruit the candidates for the various positions who had completed their education in BE/ B.Tech/ ME/ M.Tech/ MCA degree/ B.Sc Graduate/ BCA/ M.Sc Post Graduations. Most of the candidates are in confusion about the Cognizant Recruitment 2018 of eligibility details.To avoid all these confusions we are providing the accurate information like qualification required, salary, selection process, academic criteria in the following section of this page. Interested contenders can apply for the Cognizant job openings by checking this article completely. All the applicants have to apply in the online mode only. In the below of this article, we are providing the direct link to apply for the Cognizant Careers 2018. Candidates can use it without any hesitation. Contenders whose dream is to secure the job in the worlds leading professional services company like cognizant can grab this chance. The candidates who are having the practical knowledge of domain areas, technology and products will have a high priority to get select in the recruitment process. This is the great opportunity for the aspirants who had recently completed the graduation or post graduation i.e; freshers. To get the job the aspirants have to face the written test and some other rounds conducting by the officials of the company. To crack the test the candidates need proper preparation. Candidates who are trying hard to stand first in the test have to practice the previous year placement papers to come to an idea. Before that each and every applicant must be aware of the pattern of the exam. On our website, we are providing the related stuff in an understandable format. Check out all the necessary information regarding the written test of Cognizant Careers 2018 and present the exam in an effective manner. Our suggestion to the candidates is to don’t neglect this chance. Cognizant is the American Multinational Corporation which was founded on 26th January 1994 by Kumar mahadeva. This is one of the world’s leading professional services companies that provides IT services including digital, technology, consulting, and operations services. Cognizant headquarters are located in the United States and a member of the NASDAQ-100 is ranked 205 on the Fortune 500 and is consistently listed among the most admired companies in the world. The company licenses, implements, supports and develops third-party software products for health insurance plans, including the solutions for the healthcare industry, third-party benefit Administrators (TPAs), and healthcare providers. Cognizant is also providing IT Infrastructure management outsourcing services and that services include data center, network and convergence, infrastructure security, end user computing services and mobility. Have to complete 10th, 12th and graduation or post graduation in a full-time course. Must have a consistant academic record from 10th onwards. Responsible to deliver the assigned work in the given time under the module lead or team lead. Should have working knowldge on the basic programming languages. Good understanding nature of the problems clients and suggest alternatives for the customers. Ability to face the risk and should have management skills. Have to share the work among the team and to monitor them by guiding properly. To select the new aspirants every year the Cognizant will conduct the following rounds as the part of the selection process. On the top of the page, a “Career” tab is present click on it. A page will appear with the featured jobs. Candidates can use the drop down menu to change the region. On the page the department and location wise vacancies will display. Click on the desired role and go for the application process. Interested aspirants can fill the application form in the instructed manner. Submit the form by verfiying all the details. An id will generate on the screen which is unique for every aspirant. We hope the particulars about the Cognizant Recruitment 2018 will be very useful. Contenders are advised to check the details without any confusion and apply before the last date. Candidates can also bookmark our website Freshers Jobs for latest news.